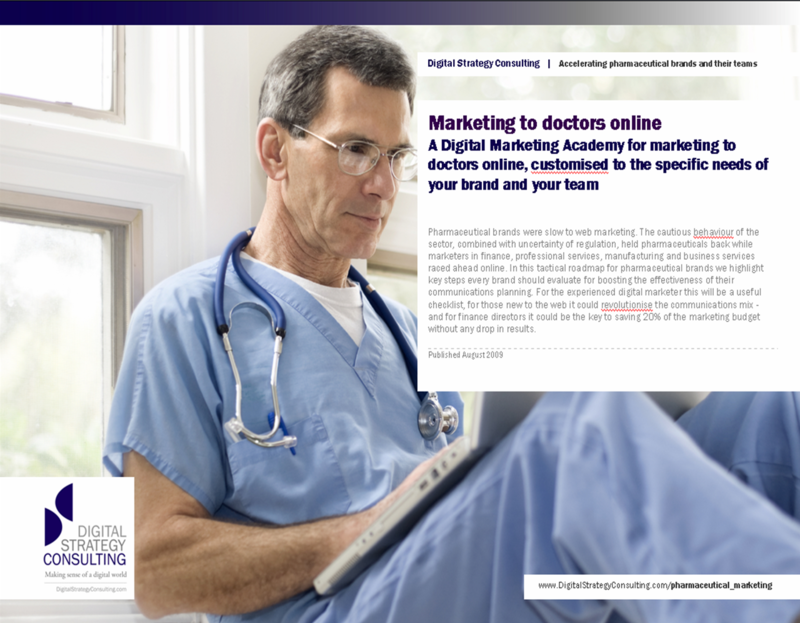 Marketing to doctors online is an essential part of today’s marketing mix. The web has become a powerful force for raising awareness, providing information, influencing purchase behaviour and creating support for sales teams. It’s critical that pharmaceutical brands who want to market to doctors online use the web effectively in their marketing. Marketing to doctors online can give you the edge for any aspect of the marketing mix, from sparking discussion and building brand image to driving sales leads and supporting customer service. There are tools and techniques that support corporate communications and lobbying objectives, as well as new ways to listen to the market and find out what doctors are saying about your brand online. Used smartly these marketing tools can boost brand equity, drive purchase intent and help you reach new prospective customers - as well as increasing purchase value and volumes among existing customers. In this digital marketing academy we showcase the smartest ways to market to doctors online. We show you the techniques and then practice them together in workshops focussed around the priority business goals your firm faces today. In the Internet Marketing Academy for marketing to doctors online, your team will learn about the latest models and approaches for building brand image and consumer connections through the web, email, social media, your own brand websites and mobile marketing platforms. Whether you are a pharmaceutical brand, a financial services company or a healthcare charity, this Internet Marketing Academy will show how to reach doctors online and maximise the ROI you can get from your marketing budgets, as well as both where and how to apply digital in your marketing mix. We’ll cover the common pitfalls in developing digital marketing campaigns, as well as giving you practical tips on effective agency management. In commerce, early adopter sectors such as insurance, ticketing, book shopping and IT hardware have shifted online almost entirely, while sectors such as real estate, new car sales and job hunting have seen the starting points in the customer journey shift while still retaining face to face contact at later stages. The journey of a customer towards purchase is now blended between traditional and digital channels. Google, Wikipedia, Facebook and YouTube are symptoms of a massive cultural shift that is restructuring economies, social connections and the way people make decisions both in and out of work. The pharmaceutical industry is simply a microcosm of this wider sea change, and while most pharma brands may have been surprisingly lethargic in embracing these new channels, the same isn’t true for their customers. From India to Latin America, South Africa to Scandinavia, doctors and healthcare professionals have embraced the web and email as a key tool in their everyday working lives. In many markets from North America to Western Europe, patients too have found the web so essential they are as likely to Google up their symptoms as they are to ask a pharmacist. The decision-making landscape for pharmaceutical purchases today is unrecognisable compared to 2000. Brands wanting to connect with patients, prescribers and purchase influencers have no choice but to embrace the new channels, and the given the general backwardness of the pharma sector they may even gain significant competitive advantage by moving quickly – as well as helping them cut costs by reducing their investment in classic channels. Among professionals the switch in behaviour hasn’t finished. Every few months people find themselves spending more time online than they did before, using more sites, talking more with their friends, clocking up more hours on social networks, and shifting more of their communications. In a world where patients turn to Google rather than their pharmacist and doctors go to online forums rather than conferences, the conservatism of the pharma industry has come at a heavy price. The Internet Marketing Academy for marketing to doctors online is normally a three day residential training programme and can be designed for experienced internet marketing teams as well as those relatively new to online marketing.